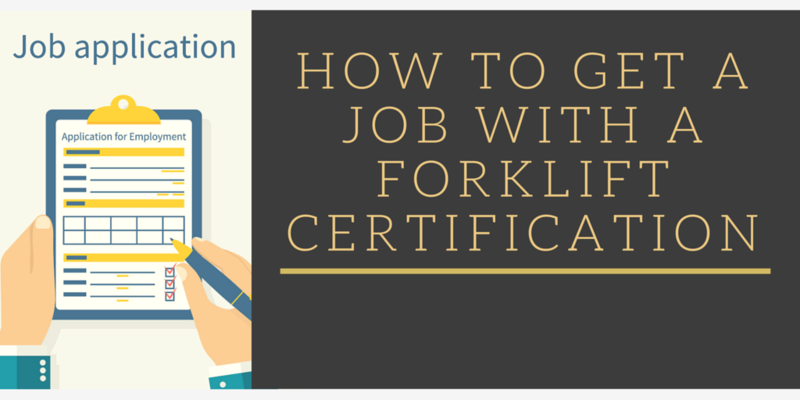 Have you just recently completed your employee forklift certification? Are you now ready to apply for a forklift operating position? While you’ve already got the number one requirement in tow, many new workers are finding it difficult to land a job when employers are also looking for experience in the field. So how do you find a job without experience? Or, get hired for a different position than what you’re experienced in? Below we’ve broken down the different ways and steps you can take to improve your chances of being hired by employers and be seen as a valuable asset, even without years of experience under your belt. ForkliftCertification.com’s training courses are the perfect way to get started with your forklift career. With three different training packages for any skill level, our OSHA compliant courses explain basic safety concepts, review important OSHA standards, and show you how to be the best possible forklift driver. A basic forklift operator certificate may not cover all of the safety training you need to qualify for jobs. According to OSHA, employers hold the responsibility to provide a safe workplace that is free of any hazards to other employees. That being said, they are looking for employees who can provide the level of safety they need to fulfill their duties. Completing safety skills training is also beneficial to experienced operators looking to switch employers because each company holds different standards. Just because your past employer may have felt you were ready, doesn’t mean a new one will. For forklift safety training, nobody beats ForkliftCertification.com! From freight quotes to maximum load capacity to other day-to-day, on-the-fly calculations, forklift drivers should be comfortable with basic math skills. We’re not saying you need to have college professor-level or Nobel Prize winner knowledge, but a solid understanding of subtraction, addition, multiplication, and division will help with daily tasks. Warehouses, lumber yards, loading docks, and shipping yards all require different skills levels and types of forklifts to handle the job. If you are a new worker and have a dream job in mind with a particular employer, research what type of forklift they use, and complete training for that. And if you’re an experienced operator looking to switch jobs, becoming specialized will help lift you to expert-level status in the eyes of your potential employer. With today’s tech-oriented inventory tracking and warehouse management software, forklift drivers are an integral part of a well-run warehouse or distribution center. With a little research and extra training, you can learn about the latest handheld devices and other computerized inventory accessories in no time at all. And with plenty of free information on the internet, it’s not hard to find operation manuals for some of the latest gadgets! As you’re looking for jobs, it’s important to not turn down the opportunity to gain any kind of experience you can get in the warehouse or construction industry, even if it means working as an assistant that does not operate a forklift. You won’t need to stay in this job forever, and you can leave after six months when you’ve gained valuable work experience that can help you land your ideal position. Look for an apprenticeship program to gain valuable experience in, even if it may be unpaid. Experienced forklift workers looking to change positions should look into refresher certification training if it has been at least 3 years, consider becoming a forklift instructor, and look into a Back-to-Work program in their local area. Some people think forklift drivers never interact with anyone else and rarely communicate with co-workers while on the job. Nothing could be further from the truth. Professional communication skills are critical for everything from keeping a safe workplace to keeping a safety training log. To be the best possible forklift driver, it doesn’t hurt to have exceptional oral and written communication skills! Completing additional education doesn’t have to be expensive or time-consuming. ForkliftCertification.com is a forklift training that provides a convenient, online program that includes safety protocols and training and offers equipment-specific training, which includes warehouse forklifts, order pickers and pallet jacks, and rough terrain forklifts. And the best part is that it only costs $299! Get started with your forklift training today! ForkliftCertification.com’s affordable prices, convenient online access, and OSHA expertise will help you and your company achieve and maintain compliance. If you have any questions about our training and would like to sharpen your skills and improve your employment prospects, call us today at (888) 278-8896.Thanks for visiting FLC!